This post was sponsored by P&G. That doesn’t mean I don’t think it’s a great deal though… just that they really wanted you to know about! 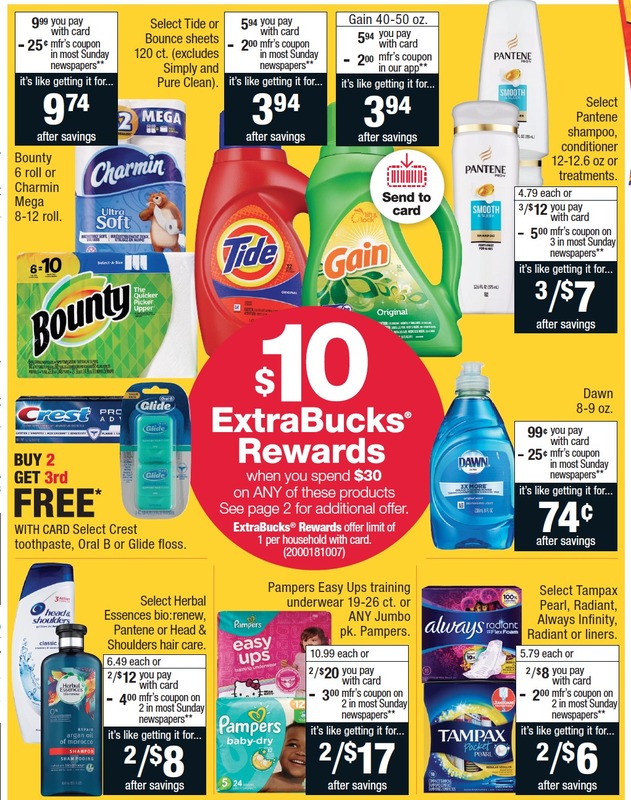 I shared recently that I always try to wait for the $10 ExtraBuck Reward deals (ECB) on household items and diapers, well this week CVS is running it! You’ll get $10 ECB when you buy $30 select P&G Items. That means an automatic 30% back, plus you can use coupons we just got in Sunday’s paper! Remember the $30 purchase requirement is before coupons, so add those in to really get a sweet deal on any items you buy. This sale will run through Saturday, 5/5, in all CVS stores. –like getting it all for $10.99 or $3.66 ea. –like getting it all for $8.55 or $1.06 ea.